Will I be able watch Al Jazeera America on Aug 20th and beyond? I know that current tv is no more, and al jazzera america to go live. The question is will I be able to enjoy it. I have been looking forward to this adtion of news channels. In my view ABC* CNN* FOX* *NBC* is not enough. I am hoping this channel goes live. Maybe some day I will get my wish in see BBCnews as well. I want more news and less news entertainment. Not that I want any of the other channels to go away. I just want more options. I like uverse dearly. I am still waiting the 1000's of channels everyone was dreaming about years ago. I am still kind of irritated., and so is my family that although we enjoy our UVERSE TV. It is still does not live up to the ideal. Kids channels are great. The educational channels are still lacking. Dreaming of the day that we have something equivalant of BBC 4 here. Re: Will I be able watch Al Jazeera America on Aug 20th and beyond? Yes. When Current TV transforms into Al Jazeera America at 3 PM Eastern time on August 20 you will be able to watch it on the same channel (189). Source? AT&T hasn't said one way or the other whether or not they are broadcasting. New owners, new contract. According to the link texasguy provided, it will be on channel 189 as anticipated. Ok cool, good possibility then thank you. Crossing my fingers... and hoping for the best.Thanks everyone. I tried several St. Louis area zip codes, each one said "No channels found for your zip!" From this I would assume that Al Jazeera America will not be available nationwide on U-Verse. That is odd since I put my zip in and it came up 189. I'm neither "yea or nay" on the channel. I just think it's a good idea to have a choice. I just tried zip codes in the Chicago, Atlanta, and Dallas areas, and received the same message of "No channels found for your zip!". I went to the Al Jazeera web site ( http://www.aljazeera.com/demandaljazeera/ ), and if the information is current, the channel is available only in New York, NY; Washington DC; Burlington, VT; Toledo, OH; and Bristol, RI. Evidentally, a few zip codes in Texas, such as where SkeeterinTexas lives, will also have the channel on U-Verse. Weirdness....I went back and entered my zip again and it's says "No channels found in your zip!" I just put in the Kirkwood zip, and a zip in South City and both said it is available on Uverse. 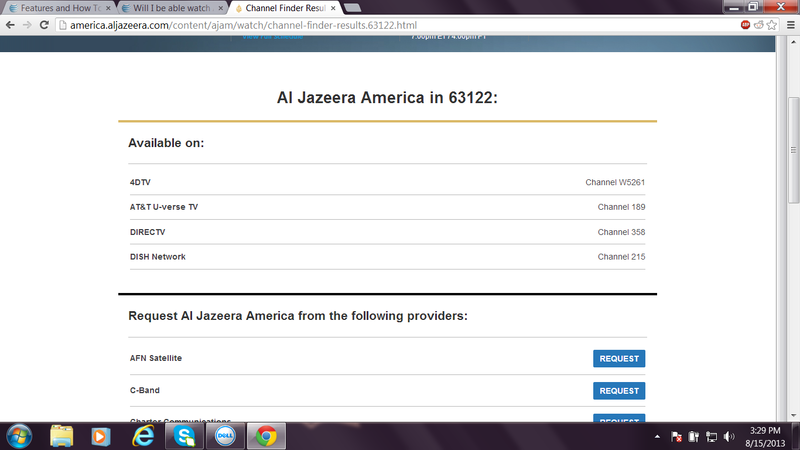 I just tried Texasguy's link again, and now it shows that I can get Al Jazeera America. The web site must have been modified since this morning when I first tried it. I did the procedure just now exactly as I did it this morning. Your link is to Al Jazeera English which is an existing channel and not the same as the new Al Jazeera America channel which launches on August 20th. It is available in the Spartanburg, SC market on U-Verse on 189 according to that link and the program guide lists all of its shows for me. So I assume I will have it.